Pasta Carbonara is an Italian dish that has bacon, eggs and Parmesan cheese and black pepper and combined with a light olive oil and added to spaghetti or linguine. 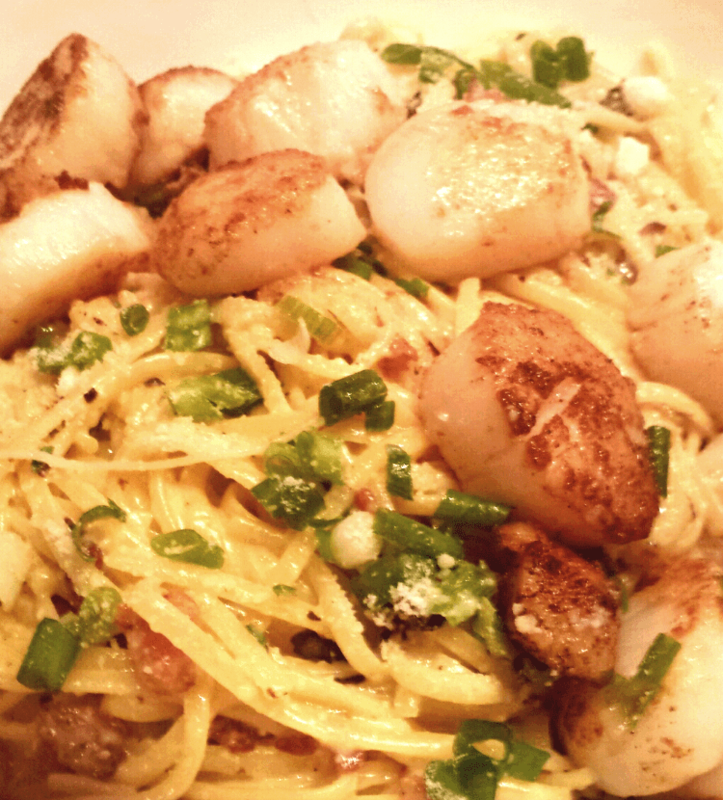 Scallops are tender and have a delicate flavor and go really well with the flavors that are in Pasta Carbonara. All of these flavors combine to make a tasty dish of Pasta Carbonara with Scallops. I think sea scallops are a great choice for this dish. Sea scallops are the larger scallop and sear up nicely to a golden brown in the pan when seared in olive oil or butter. Sea scallops only require searing for about 2 minutes on each side to get a light golden brown color and still remain juicy and sweet. After cooking the pasta and adding the ingredients if you find the pasta to need additional moistness then reserve 1/2 cup of the pasta cooking liquid and add it to the pasta after you add the egg and cheese. An alternative is to add 1/2 cup of light cream or half and half to the egg and cheese and then add to the pasta. . If you want a quick and easy to make dish for your family or for guests Try This Recipe. It only takes about 30 minutes to make Pasta Carbonara with Scallops. I like the scallops but feel free to make it without scallops if you would prefer. salt to taste, be careful because Parmesan cheese is salty and you may not need much salt. freshly ground black pepper to taste. Traditionally pepper is a big part of this dish so be liberal if you like pepper. additional Parmesan cheese for passing. Bring a large pot filled with water to a boil. When water is boiling add the spaghetti or linquine and 1 teaspoon salt and 1 tablespoon olive oil. Boil until pasta is done. Remove and drain pasta and add a 1 tablespoon olive oil to pasta. 1. In a bowl, mix eggs and Parmesan cheese and set aside. 2. In a skillet, fry bacon and cook until brown and crispy. Stir in garlic and saute for 1 minute on low. 1. Quickly stir the egg/cheese mixture and bacon/garlic mixture into the hot pasta and stir until mixed. Add up to 1/2 cup cooking water or 1/2 cup half and half. 2. 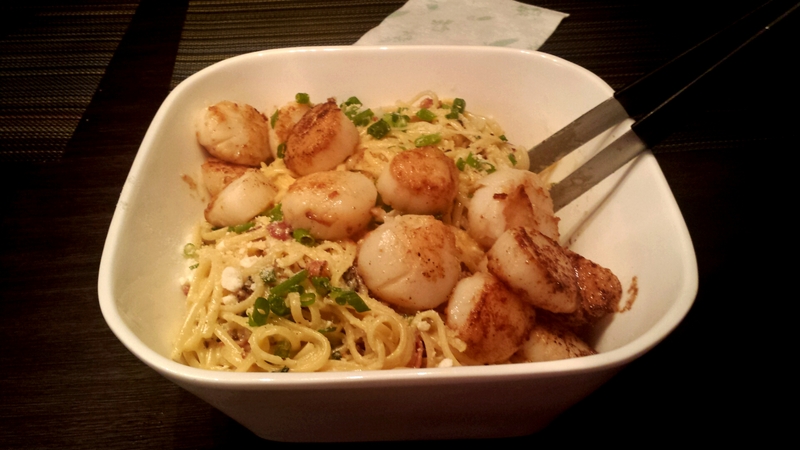 Place pasta mixture in a bowl or serving platter and top with green onions and sauteed scallops. Sprinkle with freshly ground black pepper and salt to taste. Pass additional Parmesan cheese. Thanks Elizabeth! It was tasty and so easy to make! It seems so easy to make. My husband will love it!